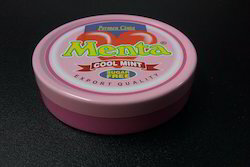 This is a tin container for packaging mint sweets. It is made from tinplate material with customized offset printing. It opens with slip cap and is user friendly. 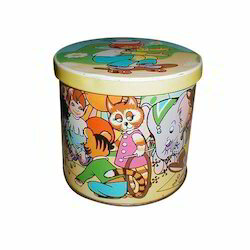 We provide square tin containers printed with various designs and messages. These are easy to carry and are offered with leak proof lids that fix tightly on the box. Our Tin Containers are highly appraised for their reliability & high performance. These can be availed as per the clients' specific needs & requirements. Our products are available at competitive market prices and are dimensionally accurate. These are utilized in various Agro industries and are known for their durability.